After years of grim news for the news industry marked by seemingly endless rounds of staff cutbacks, it’s not unusual for those thinking about a career in journalism or veterans trying to find a new job to look at options in related fields. One field outpacing journalism both in sheer numbers and in salary growth is public relations. In 2013, according to BLS data, public relations specialists earned a median annual income of $54,940 compared with $35,600 for reporters. 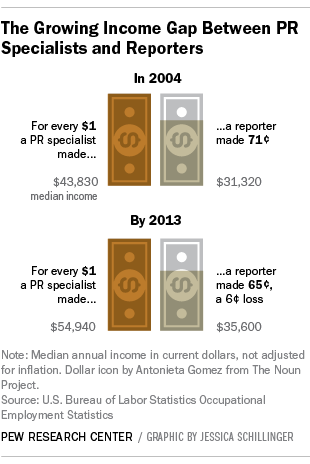 In other words, journalists on average earn just 65% of what those in public relations earn. That is a greater income gap than in 2004 when journalists were paid 71 cents of every dollar earned by those in public relations ($43,830 versus $31,320). Most of that widening has come from salary growth in the public relations industry during a time when salary increases in the journalism field did not even keep up with inflation. As the salary gap has grown, so too has the gap between the number of employees working in each field. 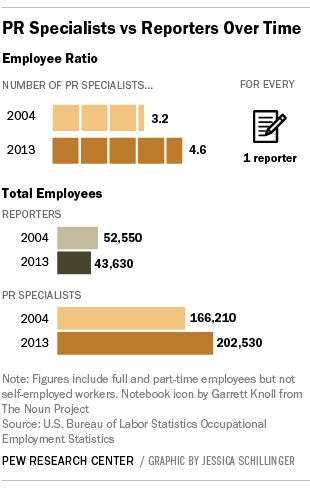 There were 4.6 public relations specialists for every reporter in 2013, according to the BLS data. That is down slightly from the 5.3 to 1 ratio in 2009 but is considerably higher than the 3.2 to 1 margin that existed a decade ago, in 2004. Over this 10-year stretch, the number of reporters decreased from 52,550 to 43,630, a 17% loss according to the BLS data. In contrast, the number of public relations specialists during this timeframe grew by 22%, from 166,210 to 202,530. The data from the Bureau of Labor Statistics’ Occupational Employment Statistics department are based on surveys of employers. The analyzed data includes the categories of “Reporters and Correspondents” and “Public Relations Specialists.” It does not include editors or public relations managers. One factor behind the increase in public relations jobs has been digital technology. Agencies and companies are now able to reach out directly to the public in any number of ways and are hiring public relations specialists to help them do so. There are ways this can be helpful to the public, such as being able to offer updates in real time about virus outbreaks and background reports on the risks associated with it. One concern it raises when looked at alongside the shrinking newsrooms is the greater difficulty reporters have vetting information from outside sources.